The greatest army in the history of mankind, the Mobile Infantry is the place for dedicated men and women who are ready to put themselves in harm's way for the safety of the body politic. Equipped with the best weaponry that Earth can provide, there are few enemies that can resist them for long. The United Citizens' Federation is in need of such soldiers. Enemies press in on all sides, terrible alien races who seek to dominate the universe and wipe humanity from the galactic map. The Arachnids are but one threat that has reared its head as they sweep through system after system. The Skinnies have also begun to muster their armies and there are rumours of yet more dreadful forces lurking at the edge of known space. Humanity needs you! Are you doing your part? The Mobile Infantry Army Book contains everything you need to construct a force of troopers capable of defending your world against any aggressor. From power suit platoons to the mighty Marauders, from the latest in Neodog engineering to the amazing TAC UAV, we provide the tools. You just have to supply the talent. 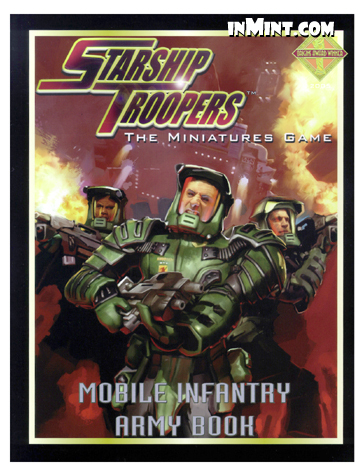 Mobile Infantry Army Book is a sourcebook for Starship Troopers: The Miniatures Game and you must possess a copy of Starship Troopers: The Miniatures Game to use the contents.